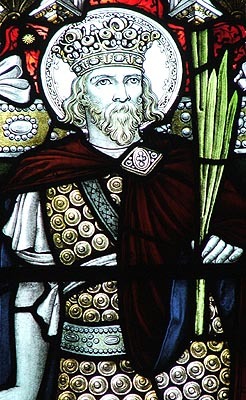 St. Tewdrig was the son of King Nynniaw of Gwent's son, Llywarch. He was King of Gwent in the early 7th century, but little is known of his reign. In later life, he abdicated in favour of his son, Meurig, and became a hermit at Din-Teyryn (Tintern). Soon afterward, however, around 630, the Saxons invaded Gwent. The local monasteries were particularly badly hit by their raids and so Tewdrig decided to come out of retirement and take up his sword once more to defend the church. Together with his son, the two Kings pushed back the Saxon menace, but Tewdrig was wounded in the Battle of Pont-y-Saeson and had to be taken to Flat Holm in the Bristol Channel for treatment. An ox-cart was called to take him there but, on their journey, the oxen stopped themselves at a miraculous spring (now known as St.Tewdrig's Well). Here Tewdrig's wounds were cleansed and here he died. King Meurig built a great church on the spot and enshrined his father's saintly body there. The place became known Merthyr-Teyryn (Mathern) after the Martyred-Prince.